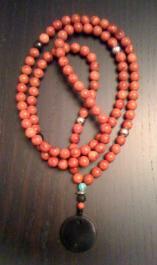 A Mala (Sanskrit for "garland") is a set of prayer beads that is believed to have originated in India around 5000 BC. Consisting of 108 beads with an additional, larger bead called the "guru" bead, malas were used in meditation to count the repetition of mantras or energy based sounds. All major religions have a form of beads or knots to count their prayers. 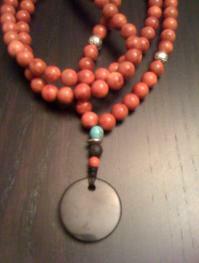 Wearing or using a mala creates a sense of tranquility and inner-peace for you and sometimes those around you. The Malas are all hand knotted, and made by me in a peaceful atmosphere, while meditatively expanding my awareness in various ways. If you would like a Mala custom made and charged with a specific mantra, prayer or affirmation, Email me to explore the possibilities. Shungite Sky Harmony Necklace has 108-6mm dyed blue jade, with Sterling Silver, OM & Shungite. pendant. The main properties of the Harmony Necklace, is provided by the Shungite and created for those who want want constant support when surrounded by high levels of electro magnetic fields and radiation. Regeneration Purification Grounding Healing Vitality. Extra long at 53 1/2" to bottom of Shungite Guru pendant. 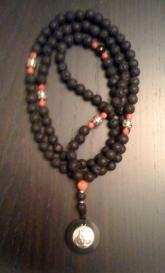 Black Onyx Ankh Mala has 108- 10mm Black Onyx beads hand knotted. 4 Sterling Silver Marker beads. Polished Black Onyx Pendant with Sterling Silver Ankh. Grounding, Strength, Endurance & Discipline. Growth and Rebirth, Immortality. Extra long at 52" to bottom of 2 3/4" pendant. iSOLA Red Coral Mala has 108-10mm Red Coral Beads, with 4 Shungite and 2 lava marker beads along with silver discs at the 27th and 81st Marker. A Sterling Silver OM disc sits in front of a Shungite Pendant. Length 42 inches plus 2 1/2inches to bottom of pendant. 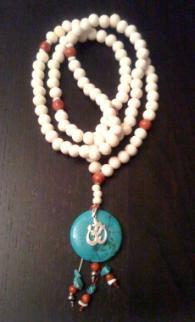 OM Ground Mala: is made to order. 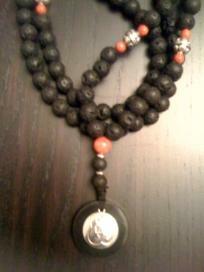 It has 108-10mm Lava beads with 4 Sterling Silver marker beads as well as Red Coral and 1 Shungite bead marker. The Sterling Silver OM disc rests in front of a Shungite Pendant. Length: 42 1/2" ......... From Mala to bottom of pendant: 2 1/2"
Purity Mala has 108-10mm beads including 2 Sterling Silver beads at the 7th and 54th marker, and 2 Shungite beads at the 27th and 81st marker. The Shungite Pendant hangs below a Turquoise bead and a Silver disc bead. Length 47" to bottom of pendant. Black Onyx Rosary has 100 Black Onyx Beads. and a Lava bead after every 10 beads, also called a Decade. There are 4 tiny Sterling silver beads at the end of the first and last two decades. Length: 41" around, plus 3 3/4" to bottom of cross. which measures 2 1/4 inches. There's only one OM Mala. 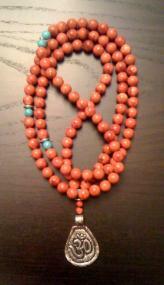 It has 108 - 10mm Coral beads, with Turquoise beads at the 27 Markers. along with silver disc beads. The Forged Silver Metal OM Pendant is 1 3/4" long. The Mala you see in this picture is the one you would receive. 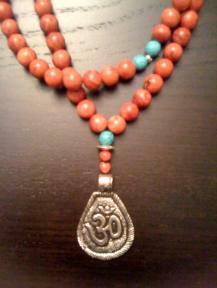 Length: 44 1/2" ......... From Mala to bottom of pendant 2 3/4"
There's only one Nava Mala. It has 108 Beads- 10mm Yak Bone beads, with 4 Coral marker beads. Tiny shell beads are on each side of the 27th and 81st marker beads. A sterling silver OM symbol rests in front of the Turquoise disc. 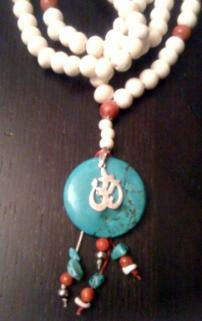 Coral, turquoise, yak bone and silver beads dangle below the pendant. The Mala you see in the picture is the one you would receive. Length 38"....... From Mala to bottom of pendant is 4"
Illuminator Mala has 108-6mm Rutilated Quartz Crystal with Black Onyx and Sterling Silver plated marker beads. Length: 36" to bottom of Shungite Guru pendant.